Thought I'd share a pic of our new pup, Ellie. She's 15 week sold now. This was taken 3 weeks ago. We are amazed every day by her and she is loved to bits, even when she doesn't quite behave as she should. Congratulations on your new addition to the family. Ellie is a beautiful German Shepherd Puppy. I love her coat color - and those ears, up already. Sables are so pretty. She is a stunning looking little lady. I know you are so proud of her. I know I would certainly be. Be sure and get her in all the socialization you can once she has completed her puppy shots sequence and start teaching her tricks as soon as you can. And enrolling her in a puppy class would be some of the best money you ever spent on her. She is a little sponge now just waiting for some educational water. So be sure and teach her all that you can! 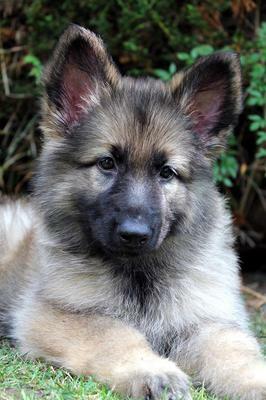 Continued success with your beautiful young German Shepherd Puppy. I wish you nothing but the best with her. And maybe a few months down the road you can send us an update and some more pictures. I would love to see how she is maturing. Good luck. W your new German Shepard. I just got a puppy also. She only 13 wks and huge already.